Previously we talked about the famous Intel’s Silverthorne processor that is going to launch in 2008, now it seems that there are actual prototypes being developed by board vendors. 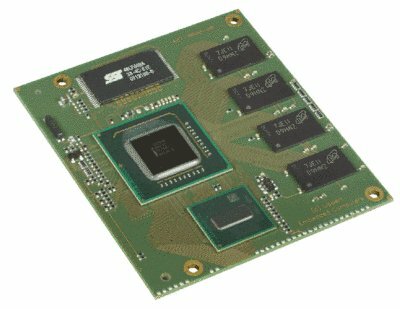 You may have seen some MID (Mobile Internet Device) and UMPC (Ultra Mobile PC) that are based on this 45-nm ultra small form factor processor, but the recent release by the Germany based company, Lippert is believed to be the first CoreExpress module targeted for embedded market. The ultra small form factor module is best fitted for automotive, Interactive client and Panel PC applications. Measured at 65mm X 58mm and weighted at only 26 grams, the module doesn’t compromise with its high performance and rich features. Thanks to its powerful X86 Silverthorne processor that is clocking at 1.5GHz. When pairing with Poulsbo chipset, it is able to offer sufficient clock cycles to run any Windows or Linux based applications while still able to provide various peripheral interfaces for external connectivity. Some of the features include PCI Express, USB 2.0 host, PATA (Parallel ATA), SDIO and Video interface which are required in most of the embedded applications. Lippert will be demonstrating the CoreExpress-Menlow in upcoming Embedded World 2008 event in Germany. We should expect more PC manufacturers to come out with new prototypes with various form factors even before official launch by end of this year.